This awesome interactive map shows China’s emerging area denial and anti-access military capabilities in the South China Sea. It is useful in visually tracking China’s progress towards creating an overlapping field of control over a vast majority of the area. The map, which you can access here, is built by the Center for Strategic and International Studies (CSIS). One of China’s highly developed islands in the northern part of the South China Sea, Woody Island, has been equipped with surface-to-air missiles and fighter aircraft. These moves have come just as many defense analysts have predicted for years and are likely an indication of things to come for China’s other island outposts throughout the South China Sea. There is also evidence that China is installing a high-frequency long-range radar array on Cuarteron Reef, one of their handful of manmade islands in the south-central part of the South China Sea. This radar type is known to be used for detecting aircraft and ships at extreme ranges far over-the-horizon and can theoretically detect some stealthy aircraft under certain circumstances. 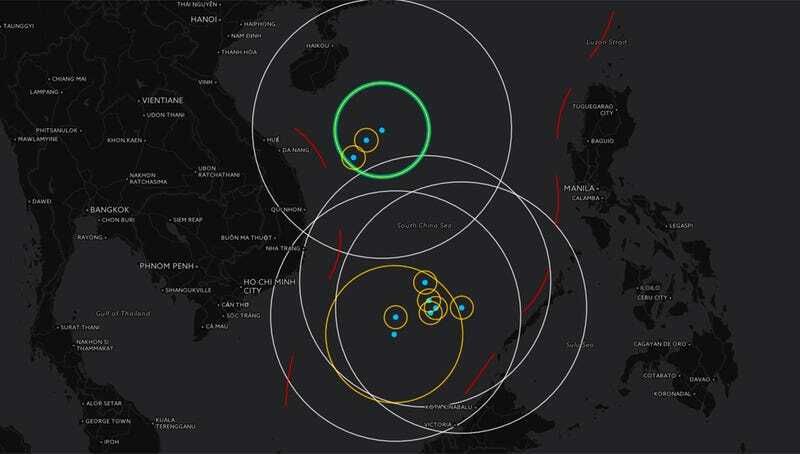 It is just one of many other sensors popping up on this island and others, although the existence of such a capability provides even more evidence that China is actively seeking an aggressive anti-access, area denial strategy over the South China Sea. This all comes as China’s largest island building project out of their manmade island initiative, Fiery Cross Reef, officially activated its 9,000-foot runway early last month. The runway is capable of supporting even China’s heaviest bomber and transport aircraft. With any luck CSIS will keep updating this fabulous visual resource as China expands its military capabilities to its other islands that remain under construction in the South China Sea. Undoubtedly, the threat rings you see today will blossom and multiply, creating a massive overlapping area of control backed up by anti-ship and anti-air missiles, as well as fighter and maritime surveillance and attack aircraft.